A few months ago I have entered a quilt at Quilts UK in Malvern, one of the biggest quilt shows in Europe. Last weekend the show took place and I received the wonderful message that my quilt won three ribbons! 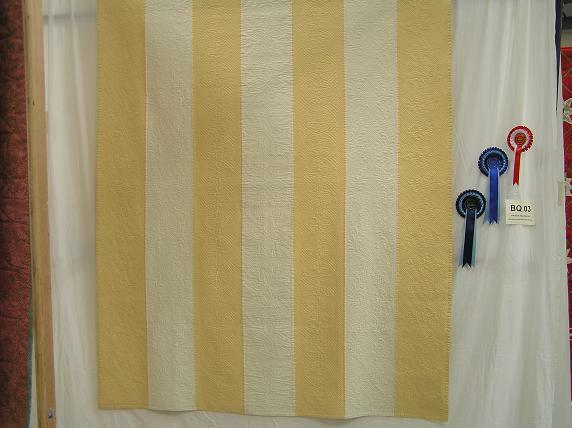 3rd in the category bed quilts, the Award for Wholecloths and the Award for Handquilting. Three ribbons in one sweep...I am so proud! Congratulations!! You should be proud! That's quite an acheivement! Congratulations, a beautiful quilt. It's a show I go to every year, and as always the quilts were beautiful. I always find it a little less intimidating than the Festival of Quilts which is in Birmingham in August. Congrats! You worked hard and earned it!! Congratulations - what a very pretty quilt! Your work is spectacular ! No surprise it was going to get the recognition it deserves. Be proud. I know if it was me I would be standing a little taller. Nothing left for me to say - previous posts say it all - you go girl - you deserve three ribbons. 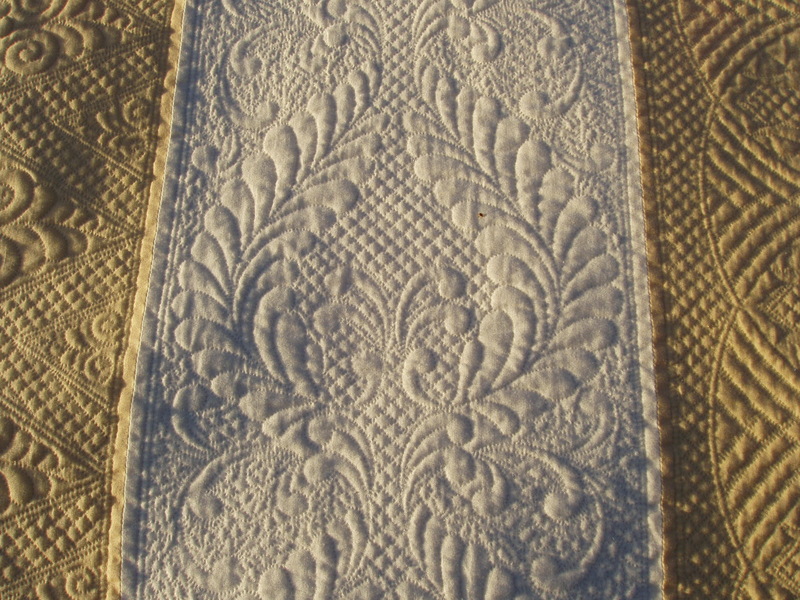 I have entered a quilt at the World Quilt Show in August. Hopefully it will be accepted. Oh, that would be so wonderful!! That's the one here in New Hampshire! Your work is truly inspiring, Andrea. Congratulations on your success at Quilts UK. Congratulations, Andrea - you earned those ribbons! Congratulations on another beautiful quilt and the well deserved awards. I love looking at your work, and I'm always happy when your work is awarded. 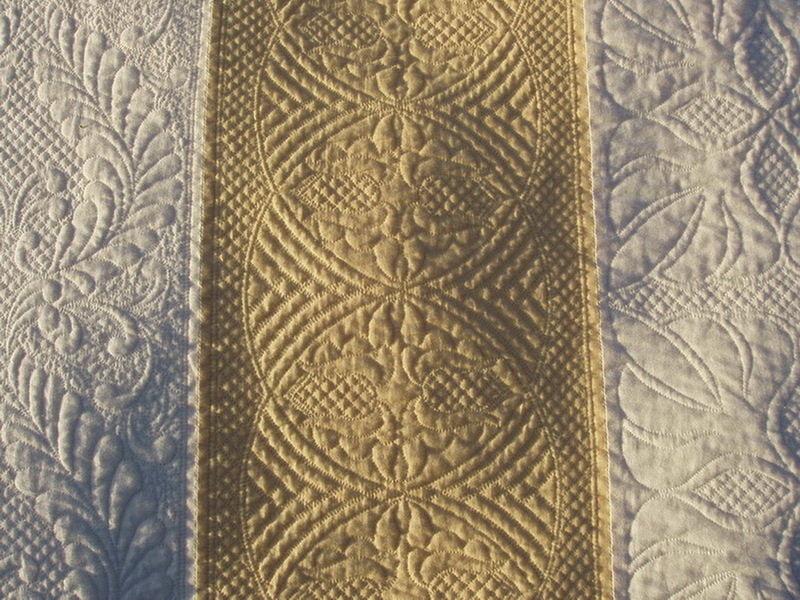 First ... can we PLEASE see some closeups of your quilt design? Your designs are always beautiful and the execution is flawless. Second ... Is this quilt dyed or pieced strips? I am guessing dyed (or printed) because it is in the whole cloth category (unless the rules for that category are different in that show and they allow "some" piecing?). Congrats. I am always in awe of your work. Beautiful quilt! Congrats. The quilt and quilting are beautiful! Congratulations! And, it's a beautiful quilt. Good job, lady! Way to go, wonderful quilt!!!! 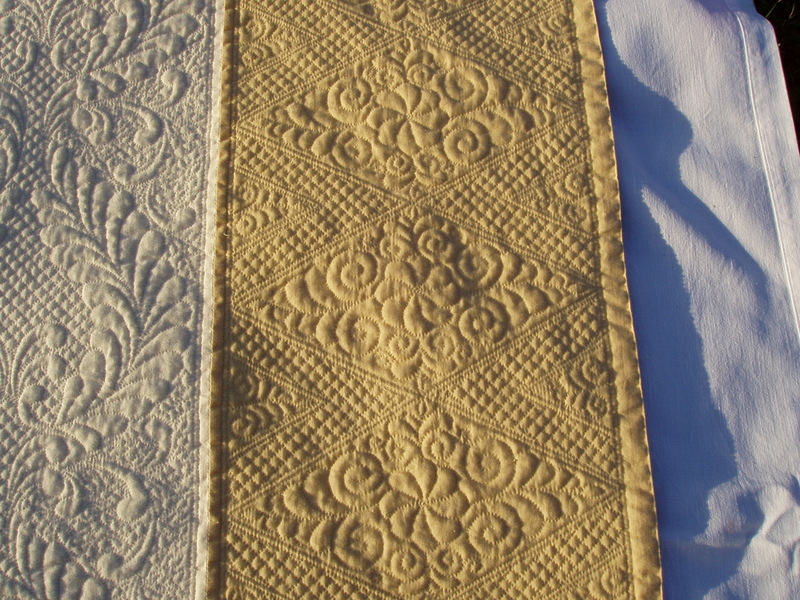 Here are some closeup pictures of the quilt. The strips are pieced, not dyed. There mostly are different rules in UK compared to US - strippy quilts like this one are considered as wholecloth quilts because the quilting, not the piecing makes the design of the quilt. Congratulations! Your work is always amazing! Your work is so beautiful, you deserve the honor. Congratulations. You should be proud! Your hand quilting is marvelous. You take hand quilting to a whole new level. Andrea, that's wonderful!! I do so enjoy seeing your work! Can we please see a close up of this one sometime?